Tamsin Rebecca: New Year, New Attitude! A very happy new year to you all, isn't it wonderful to be in 2015!? We're now well in to the second full week of the year and it's about time I posted something for you all. Last year I did a post on my new year's resolutions and I'm going to do a similar thing with this post. I'm now back at university and settling in to my routine again but as many of you have messaged asking to meet me I'm also on the lookout to meet some of you so if you see me around, say hi! Also, if you're a blogger in the Chester area then drop me an email as I'd love to get to know the some of you lovely local bloggers. Every year my resolutions tend to be the same, but this year I've decided to come up with some that are a little different to the things I'm used to. 1. Get outside more and enjoy the world around me. I spend a lot of time indoors whether it's down to laziness, workload or other reasons and for this reason I really want to go outdoors more. I have been in Chester for over a year now and there's still so many places I haven't seen! 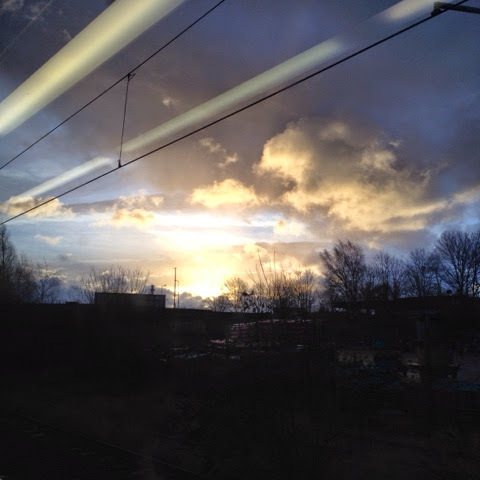 My recent trip to Manchester had me seeing sunrise on the train for the first time! This one is a bit of an add on to the first resolution. I used to love running but in recent years I just don't go quite as often as I'd like to and it's led to a decline in my fitness levels. This year I'm taking some inspiration from Sprinkle of Glitter who's doing #GlitterGetsFitter on her Instagram (@sprinkleofglitr) and going out on more walks which I will build up to runs. I'm also going to workout more and find fitness routines I can do at home away from the gym. I am a huge fan of takeouts, as those who know me are very aware of, however they are a huge waste of money. I'm determined to cut down to a maximum of 5 takeouts per term and instead opt to cook the meals I may be ordering in a healthier manner. The inspiration for this actually comes from Jamie Oliver's new cookbook - Jamie's Comfort Food. I've only flicked through it but it made me realise that I don't need to order junk food that's full of fat and oil and grossness because I can make much healthier versions of it myself! 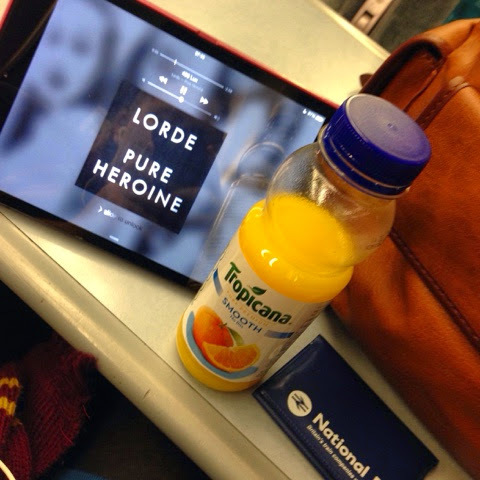 I've also been drinking fruit teas and keeping cleansed, it's really rather refreshing. 4. Go out partying less. This is something I actually decided to do at the start of the academic year. I have found that the idea of going out dancing and drinking doesn't appeal to me quite as much as it did last year, I'd much rather have a night in with a bottle of wine and a good book or movie. It's also going to save me an awful lot of money. 5. Save as much money as possible. Leading on from the two previous, this is something that's highly important to me. Next year is going to be a huge strain on my wallet if I'm going to get my own place so I really need to put as much money aside as possible. 2015 is a huge year for me and it's going to take a whole lot of growing up. On the 6th of January I turned 20, I can no longer use the excuse that I'm just a kid or a teenager. I'm an adult and it's terrifying. But I'm determined that this is going to be my year, and I'm going to smash it right in the face. Let me know in the comments below what you've got planned for the year ahead, or you can let me know by getting in touch through twitter, facebook, instagram or email. All of my social media links are listed here. I wish you all lots of love and happiness in 2015.